specific situation, and then establish effective goals for influence against which to measure progress. In doing so, investors also can assess the potential usefulness of the tools available to them and the effectiveness of the tools they have selected. 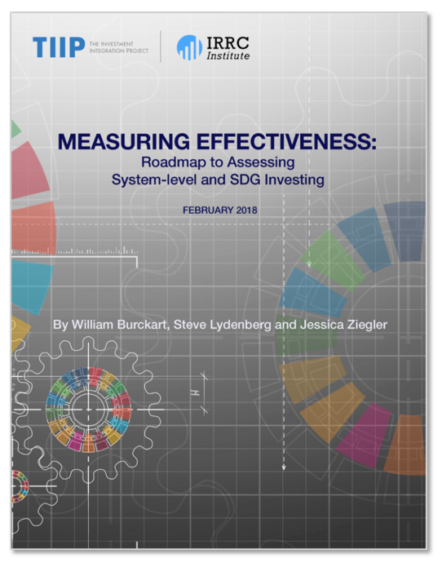 Ultimately, this approach enables investors to assess their influence in determining changes at the system-level itself and the potential contribution of their efforts and investments. Global Impact Investing Rating System (GIIRS), B Lab - Data platform for collecting, benchmarking, and reporting on social end environmental impact of companies and funds. Features include pre-built metric sets, goal-setting functionality for investors, and the largest dataset of private company impact data. Impact Reporting and Investment Standards (IRIS) - IRIS metrics are designed to measure the social, environmental and financial performance of an investment. You can filter based on your investment priorities and focus areas. Started with reading Getting Started with IRIS. Global Reporting Initiative (GRI) Standards - The GRI Standards lists over 400 indicators on on a range of economic, environmental and social impacts. Sustainability reporting provides information about corporate sustainability performance. Sustainability Accounting Standards Board (SASB) Navigator - Sustainability research platform that helps investors find which ESG issues impact corporate performance and how well companies are disclosing on those issues. Navigating Impact -Created by the Global Impact Investing Network (GIIN), the database helps investors select impact strategies and adopt metrics that indicate performance toward their goals. Toniic Impact Portfolio Tool – Version 2 - An Excel-based tool that allows an investor to classify every underlying investment by its intended impact, as well as other variables that investors take into consideration when designing their portfolios — such as liquidity, expected returns, geography, management structures, and more. The outputs of the tool are visual representations of the individual portfolios. Are you on track to meet your targets and how could your investment strategies be improved?